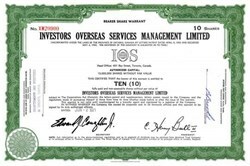 Beautifully engraved certificate from the Investors Overseas Services Management Limited issued in 1969-1971. This historic document was printed by the Canadian Banknote Company and has an ornate border around it with a vignette of the company logo. This item has the printed signatures of the Company’s President and Secretary and is over 31 years old. There are over 28 unused coupons attached to the bottom of this certificate not shown in the scan. Bernie Cornfeld was the Founder of Investors Overseas Services mutual fund. He ran the fund out of Geneva, Switzerland beyond regulators' reach, and raised over $2.5 billion before it imploded in 1970. He spent 11 months in a Swiss jail before fraud charges were dropped. Creditors seized his Beverly Hills, California, estate where he partied with girlfriend Heidi Fleiss, now of "Hollywood Madam" fame. He was plotting a comeback from his Swiss castle before he died in 1995, following a stroke. Friends had to chip in to pay his medical bills. After investors began to sell off during a market downturn, Cornfeld was replaced with financier Robert Vesco, who was accused of looting the company of $224 million and subsequently fled to the Caribbean. Vesco was later sentence to a 13-year prison term in Cuba on unrelated charges stemming from allegations that he tried to produce and market a miracle cancer drug to overseas investors without the communist government’s knowledge.